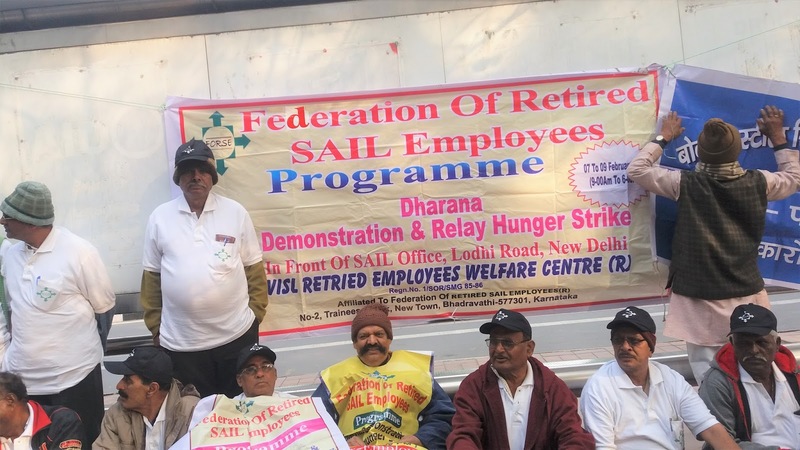 BRINGING cheers among tens of thousands of steel PSU employees the Ministry of Steel last week agreed to a proposal to introduce a pension scheme for employees of all steel public sector undertakings. The proposal would benefit over 94,000 serving and 56,000 retired employees and it would be retrospectively effective from January 2007 for executives and January 2012 for non-executives. PSU employees of Steel Authority of India Ltd, Rashtriya Ispat Nigam Ltd, MSTC, Ferro Scrap Nigam Ltd (FSNL), Metallurgical and Engineering Consultants Ltd (MECON) and Kudremukh Iron Ore Company Ltd (KIOCL) would be benefited from the scheme. Two other PSUs under the ministry, India's largest iron ore miner National Mineral Development Corporation and Manganese Ore India Ltd have already introduced the pension scheme to its employees as per the Second Pay Revision Committee recommendations. "This was a long-standing demand from the employees of these PSUs," said steel minister Chaudhary Birender Singh. "It will put an additional financial burden of Rs. 45 crore per month (Rs 540 crore per annum). But it will be subject to factors like affordability, capacity to pay and sustainability of the CPSEs. There will be no government budgetary support to operate these schemes." The rate of contribution will be decided by the respective boards of central public sector enterprises (CPSEs) each year depending upon the profit made and employee cost to the company. It will be subject to an upper ceiling of 30 per cent (Basic Pay plus DA) of superannuation benefits. The actual details of the pension scheme and road map of implementation will be worked out by the management of each CPSEs. "There are new headwinds emerging in the market and there is no sign of imports swelling just yet," Singh said. "But we are alert and would be able to meet any challenges in future." The steel prices have gone up from Rs 29,000-32,000 per tonne in 2016 to Rs 51,000-54,000 per ton, an increase of about 40%. Fuelling a tug of war in the international market, the US has already announced a 25 per cent duty on steel imports from August 4, prompting the EU announced quotas for 23 steel product categories based on the average of imports over the past three years, with a 25 per cent tariff set for volumes exceeding those amounts. About 6 per cent of India's steel exports go to the EU, with much of it being exported to Italy. EU's notified tariff increases will hit some 14 steel product lines.